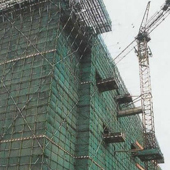 Our company has gained reputable position in this domain for manufacturing and exporting high end quality Construction Safety Net. Widely used in the construction industry, these nets are appreciated for their excellent flexibility and ability to bear heat, water and other harsh weather conditions. Our wide range of construction safety products can be customized as per the specific needs of our honored patrons. Fabricated by using polypropylene ropes, these nets are knotted in meshes. The knots make the Construction Safety Net highly durable, strong and resistant to heavy load impact.